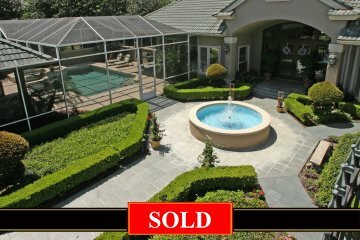 Beautiful estate home - recently reduced for prompt sale! This home is a perfect blend of formality and casual elegance. Directly on the famed Gary Player-designed golf course in prestigious Alaqua, a gated, golf and country club community 20 minutes to the north of downtown Orlando. A very special feature is the detached Guest Suite with private entrance overlooking the Pool/Terrace area. 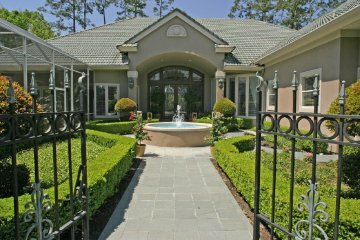 The front iron-gated entry opens to a beautiful courtyard enhanced by English gardens and manicured Boxwoods and an impressive large fountain. 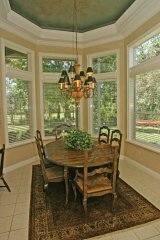 You will enter the beautiful interior through double French doors which are part of a 16’wide leaded beveled-cut glass door system with transoms above, allowing the wide marble foyer to be naturally lighted by Florida sunshine. The moment you enter the marble Foyer you are looking though the Living Room out to the golf course through a 15’ wide window. The 19’ Dining Room is perfect for entertaining. A wet bar with mirrored wall and glass shelving is located in the alcove just off the Living Room. The formal rooms have hardwood flooring. 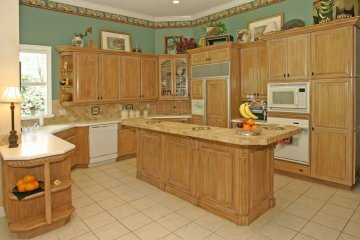 A spacious Kitchen, with Breakfast Area overlooking the golf course, opens to the golf front Family Room, but is separated from it by a custom built cabinet with message center and wine cooler. 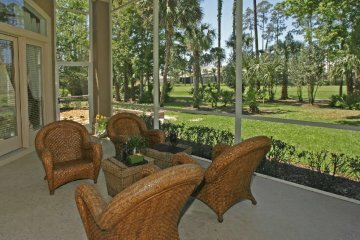 Kitchen is equipped with all appliances and an 8’ cooking island embraced by a wrap-around snack bar. 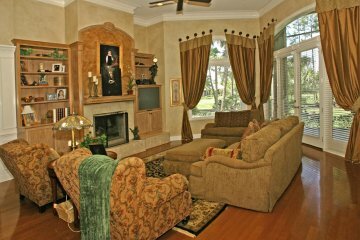 The Master’s retreat consists of a large, golf front Bedroom, an adjoining Sitting/Exercise/Nursery Room, and a handsome Study with custom built bookcases, file cabinet storage, and hardwood floors. On the opposing side of the floor plan there are two large bedrooms with adjoining baths, each with their own 5’ vanity and a shared commode and tub area. There is one other 19’ room on the second floor which could be used as a 4th bedroom or a Bonus Room – a nice retreat for an older child. A beautiful Guest Suite has its own private entry off the courtyard and is just perfect for your extended family or guests. 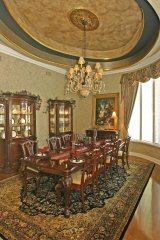 The interior of the home is finely crafted with extensive use of detailed crown molding and cased openings into rooms, tray ceilings adorned by deep moldings and back lighting and beautiful ceiling height fireplaces crafted of stone and wood. Walls are hand painted in subtle tones. The bathroom walls reflect the artist’s touch with hand-painted stencil designs in traditional damask pattern. 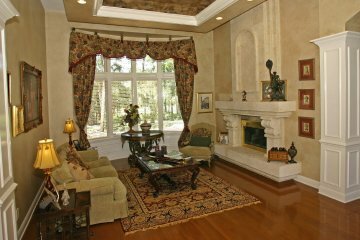 Window treatments throughout are custom made of silk and taffeta fabrics. 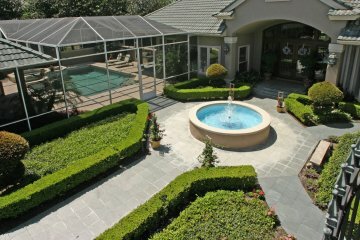 A heated Pool and Spa are surrounded by a lovely Terrace and a Summer Kitchen. 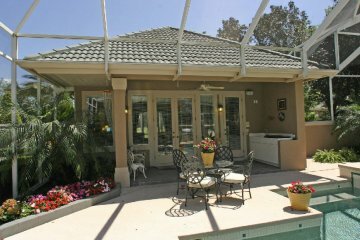 This is an exceptional home with beautiful views in one of Central Florida’s most prestigious golf and country club communities. The Country club is private and has a pool, tennis courts and wonderful dining facilities overlooking the verdant greens of the course. All this designed for your pleasure! $1,295,000.